The French Revolution was a major event in the history of Western societies, and has had a profound effect on the world today. Beginning in 1789, the French Revolution saw the French people overthrow their absolute monarchy and bring about a republic that was based on the principles of equality, liberty and fraternity. Throughout the years of the revolution, there were four different revolutionary governments, including: National Assembly, Legislative Assembly, National Convention and the Directory. The National Assembly was the first revolutionary government of the French Revolution and existed from June 17th to July 9th in 1789. The National Assembly was created amidst the turmoil of the Estates-General that Louis XVI called in 1789 to deal with the looming economic crisis in France. Unfortunately, the three estates could not decide how to vote during the Estates-General and the meeting failed. 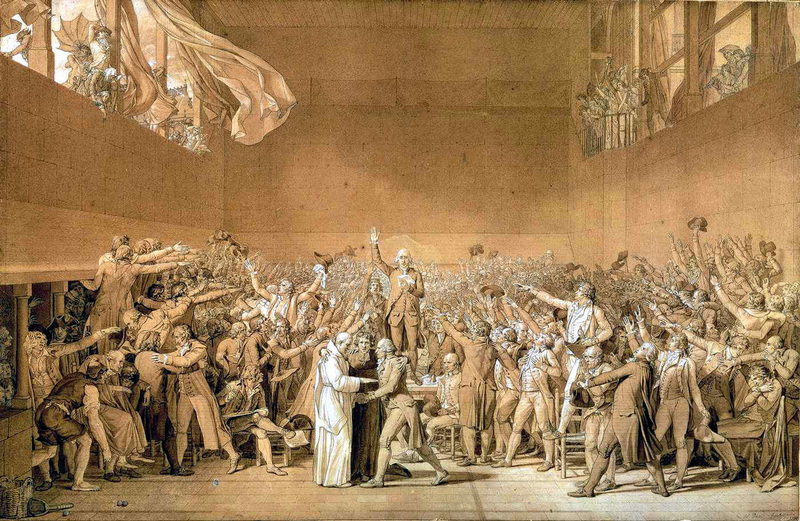 Angered with the inaction of the Estates-General and upset with their position in French society, many of the third estate representatives left the meeting and gather in a nearby tennis court to take the Tennis Court Oath. It was here that the third estate established the National Assembly, the new revolutionary government, and pledged "not to separate, and to reassemble wherever circumstances require, until the constitution of the kingdom is established." Although the National Assembly was originally made up of mostly members of the third estate, many clergy and nobility representatives soon joined as anger for the monarchy of Louis XVI spread. After July 9th, the National Assembly formed into the National Constituent Assembly, which would last until September 30th, 1791. The National Constituent Assembly is best remembered for passing the Declaration of the Rights of Man and of the Citizen in August of 1789. The declaration was written by Marquis de Lafeyette, a French military officer who fought in the American Revolution and was inspired by the ideals of liberty expressed by Thomas Jefferson in the Declaration of Independence. The Declaration of the Rights of Man and of the Citizen was vitally important to the French Revolution because it directly challenged the authority of Louis XVI. For example, the declaration set out a series of individual rights protected by law. Today, many historians view it as an important document in both the history of the French Revolution and the history of democracy and individual rights in the world. As well, the issuing of the Declaration of the Rights of Man and of the Citizen by the National Constituent Assembly helped spark the first major violent act of the French Revolution; the storming of the Bastille. The National Constituent Assembly dissolved itself in 1791, passing government to the newly created Legislative Assembly.